As I’ve gotten older, I’ve become more disillusioned with the commercialism surrounding the holiday season. Despite nods to minimalism and periodic reminders to “put Christ back into Christmas,” culture continues to tell us that the holiday is all about the presents, and more is definitely better. We all know that simply isn’t true. The stores have been Christmas-ready for months now, so it’s possible that you are done with your Christmas shopping, with gifts neatly wrapped and waiting patiently under the tree. But if you’re anything like me, you’re only just beginning to think about Christmas gifts and may or may not have purchased a single item; if that’s the case, this post is for you! Just like last year, I’ve based this year’s guides on what I know best: our own family’s Christmas lists. 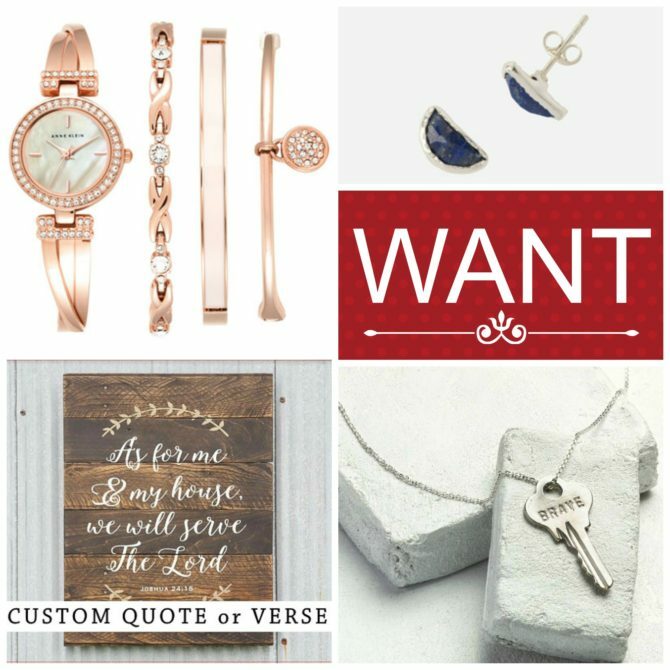 Today I am sharing gift ideas for the young Mama (i.e., my own personal wish list). On Wednesday I’ll share my Luke-approved guide to shopping for a young Dad. We’ll round out the week on Friday with Charlie’s recommendations for Toddler gifts. 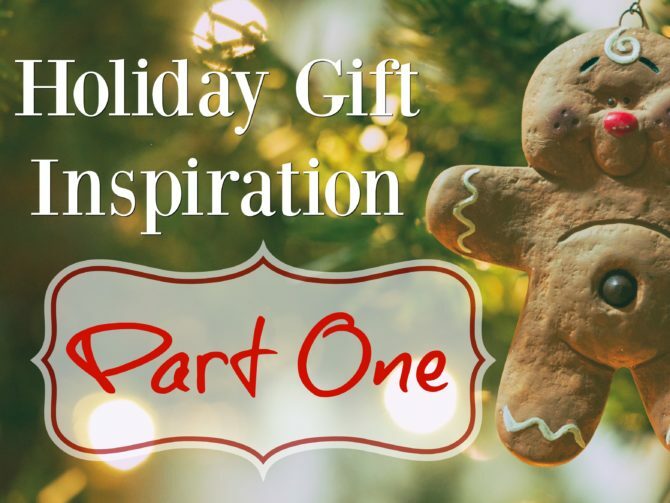 As I’ve done in the past, I’ve divided my gift suggestions into categories: something they WANT, something they NEED, something to WEAR, and something to READ. 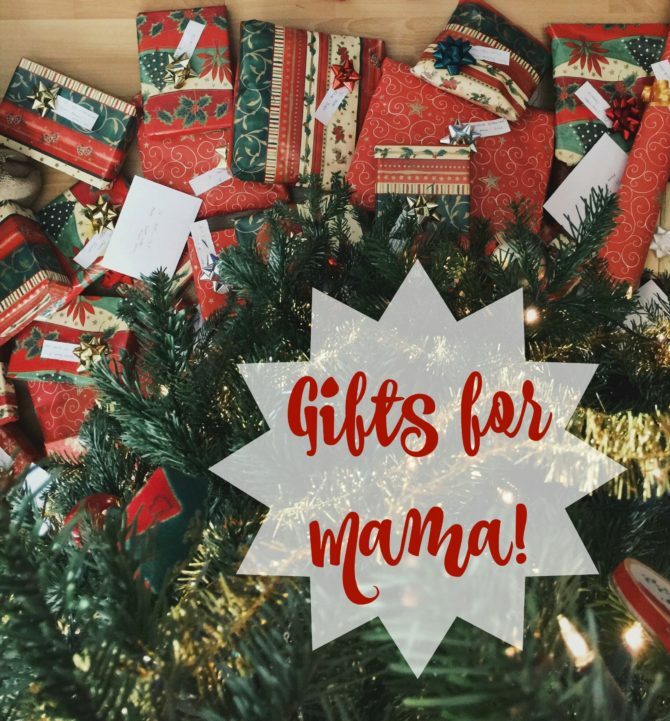 We experimented with this format for our family gifts last year, and I loved the balance, structure, and intentionality it added to our buying and giving of gifts. Anne Klein Rose Gold Watch & Bracelets Set // Rose gold is having a moment right now, and this gorgeous watch is an accessory she is sure to love. The accompanying bracelets are so pretty! Circlet Stud Earrings from Noonday // Hand-crafted by an artisan business in Jaipur, India, these studs are the perfect gift for the socially-minded mama (or any woman who loves unique jewelry). Custom Pallet Sign // These lovely pallet signs come in various sizes and finishes and can be personalized with her favorite quote or verse. Dainty Giving Key Necklace // This necklace can be engraved with a name or word that is meaningful to her. This would be a particularly thoughtful gift if the recipient has chosen a Word of the Year for 2017. Lily Jade Madeline Diaper Bag // The beautiful leather bags from Lily Jade double as purses, making them great for any woman, even if she has graduated past the diaper bag stage. I’ve been pining after this particular bag since long before Charlie was born. Instant Pot Multi-Functional Pressure Cooker // This single appliance has SEVEN functions, including slow cooker, pressure cooker, rice cooker, and steamer. I’ve heard wonderful things about this particular model. Calcot Growers Collection Cotton 6-Piece Towel Set // My in-laws have these towels and they are insanely soft. If she’s been married for more than a handful of years, she’s probably ready for some new towels! Available in multiple colors. Cozy Sherpa Robe // There’s nothing better than a fluffy robe. Just the pictures of this soft and snuggly one have me swooning! Plaid Blanket Wrap Scarf // Clothes can be tricky: guessing sizes and style preferences is sometimes a losing battle. But scarves are fairly universal, and the multiple colors in this pattern make it a seamless addition to any wardrobe. Halogen Chain Band Floppy Hat // Even if she isn’t a hat person, help her branch out of her fashion comfort zone with this on-trend wool hat. I never thought I would wear hats until my brother and sister-in-law gave me one as a birthday gift; now I rarely go without one! 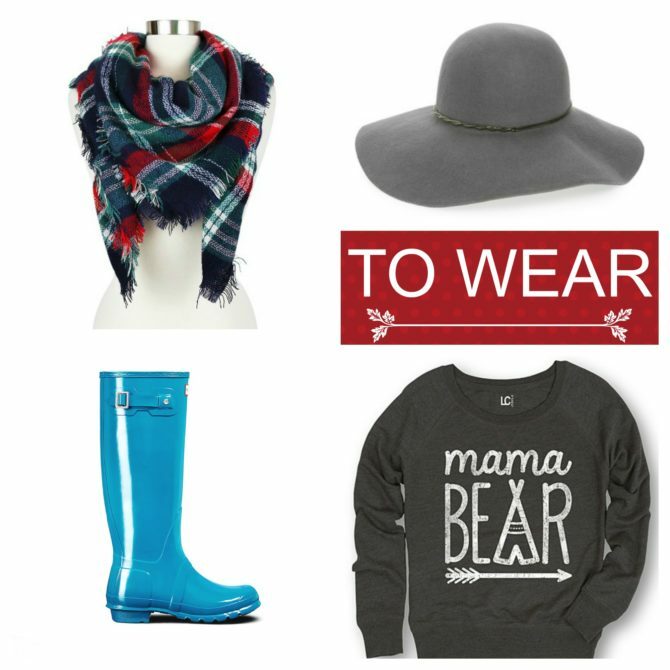 Mama Bear Sweatshirt // Cozy and cute. Bonus points if you get her child a Baby Bear sweater to match! 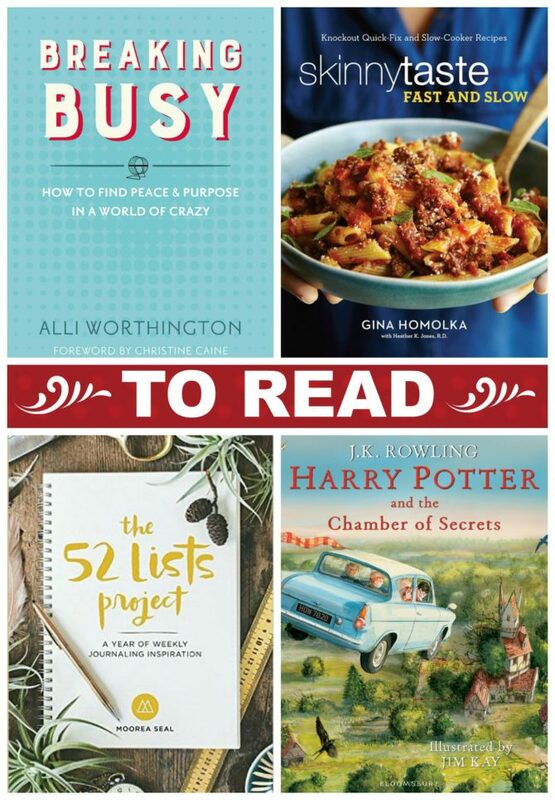 Breaking Busy, by Alli Worthington // I heard Alli interviewed on a recent podcast and immediately added her book to my TBR list. Her God-centered approach to finding balance is a message many of us need to hear. Skinnytaste Fast and Slow: Knockout Quick-Fix and Slow-Cooker Recipes, by Gina Homolka // Gina’s first cookbook is a favorite of mine, and I am so excited that this one is entirely dedicated to the slow cooker (i.e., every mama’s favorite kitchen appliance.) 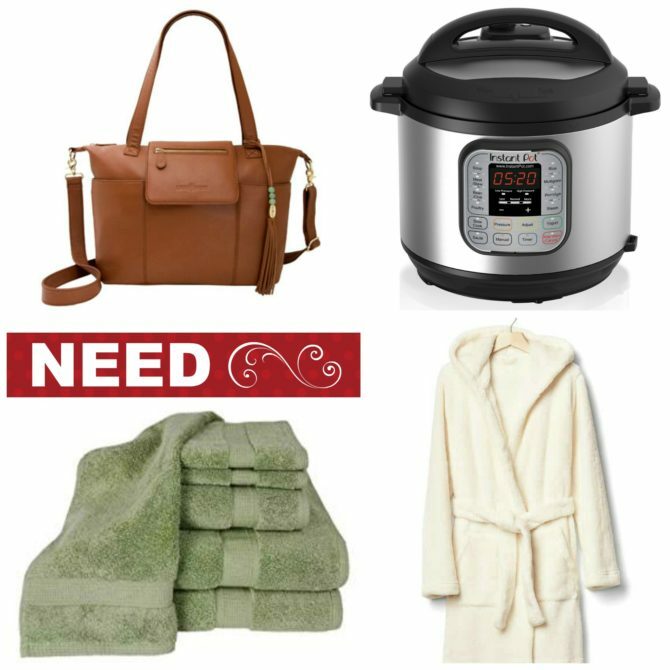 This would make a great combination gift with the pressure cooker listed above. The 52 Lists Project: A Year of Weekly Journaling Inspiration, by Moorea Seal // Filled with season-appropriate prompts, this book is designed to “help you discover the beauty, joy, creativity, and power you already have!” Perfect for the list-maker, the journaler, or anyone looking for a new creative venture. Harry Potter and the Chamber of Secrets: Illustrated Edition, by J.K. Rowling // This one might not be on every mama’s wish list, but if she’s a Harry Potter fan, she’s sure to appreciated this beautiful edition! Gift certificate to a local salon for a massage or mani/pedi. Book a house cleaning service to have her house professionally cleaned. Tickets to see a live show at a local theater. Gift cards to a favorite restaurant, clothing store, or coffee shop. Annual membership to Audible, Audiobooks.com, or Book of the Month Club. Volunteer to watch her children or pay for a babysitter so she can have an afternoon to herself. Subscription to a meal service like Hello Fresh or Blue Apron. Lessons in a hobby you think she might enjoy like dancing, cooking, or painting. Gift card to Stitch Fix. Lots of hugs, kisses, and encouragement!